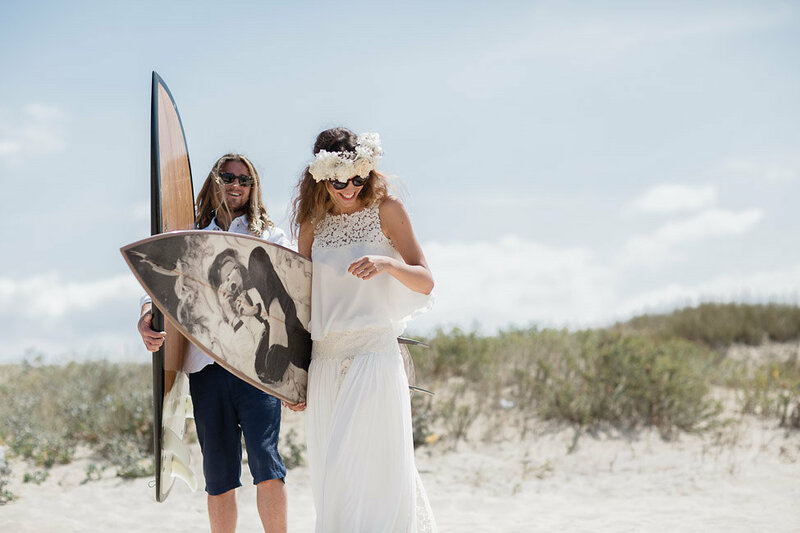 A day to remember…pure nature, true love and two surfers consolidating their union. 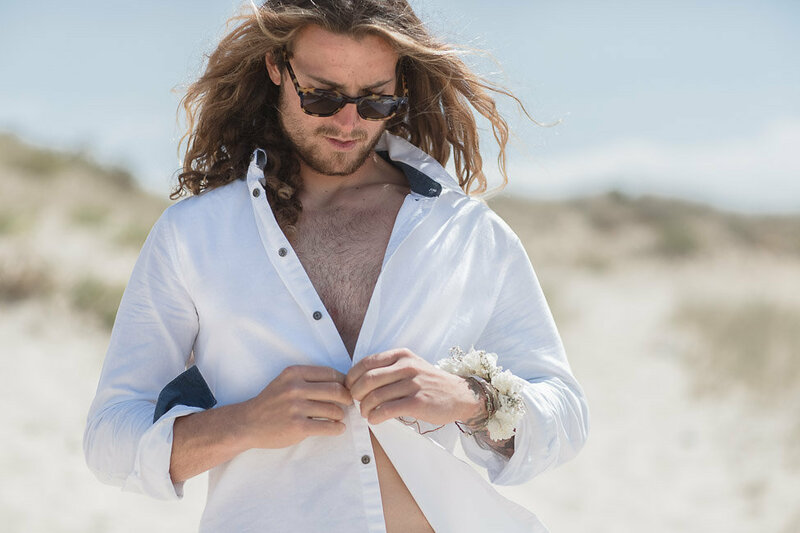 The souls of these two surfers met in the middle of the Cantabric Sea close to the French South West Coast. 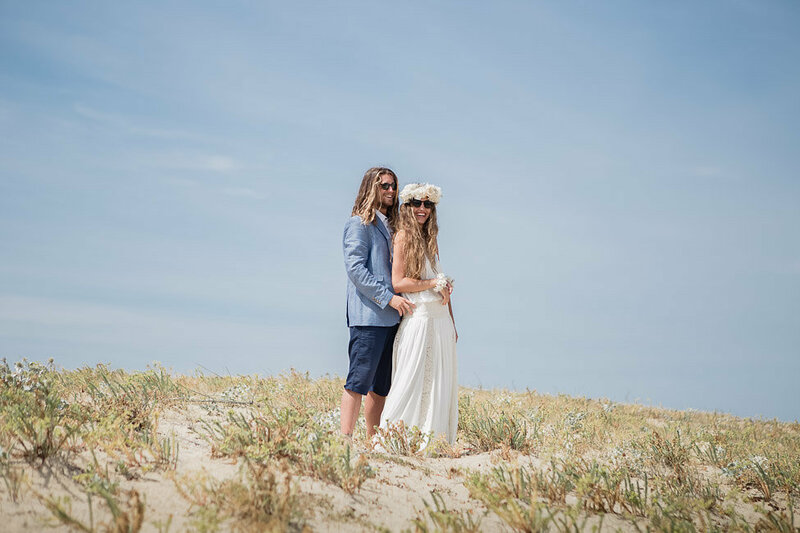 This romantic but wild Boho Surfing Wedding at Les Landes was lived by a beautiful couple who share two passions; surfing the waves and consolidating their union in pure nature. 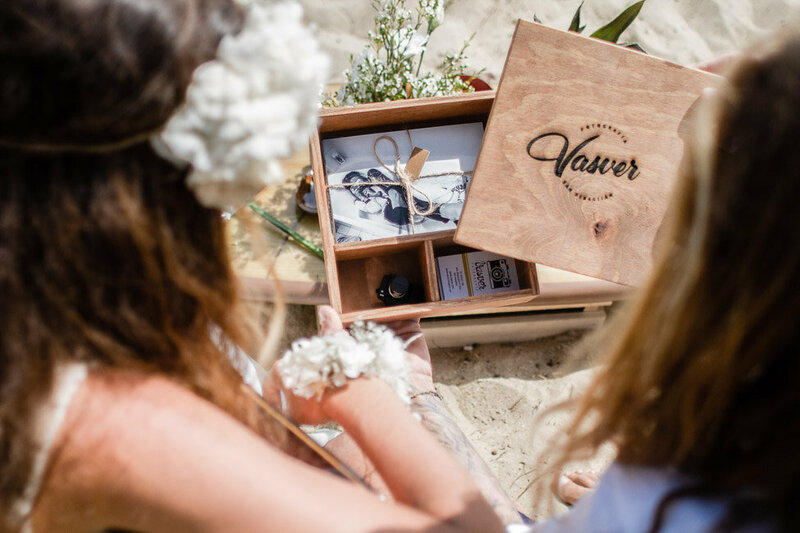 Vasver Fotografía, is a International wedding photography Studio located in one of the most beautiful cities in the world, San Sebastián (Basque Country). 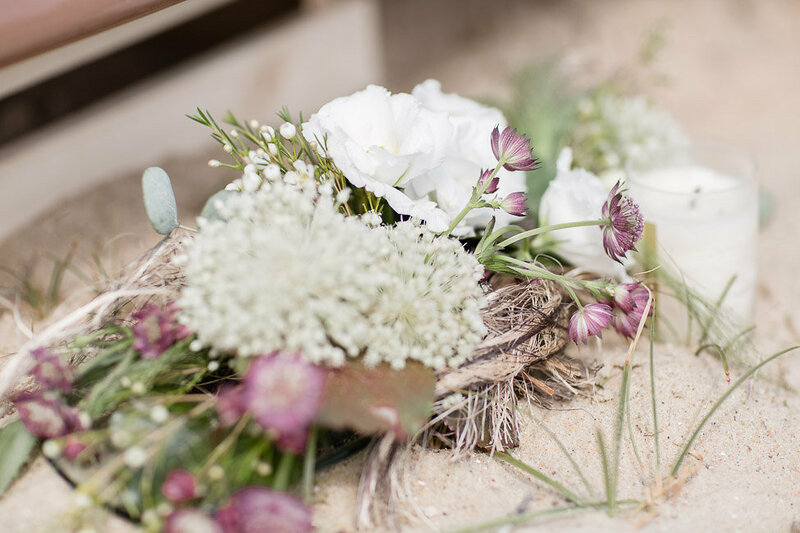 We are sharing this unique Boho Surfing Wedding at Les Landes…do not miss any detail…we fell in love with everything! 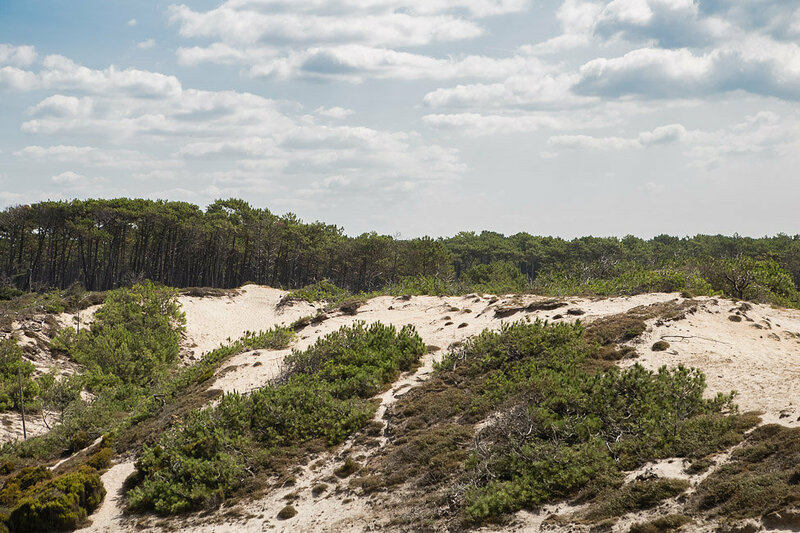 Les Landes is the home where the waves crash, a paradise for surfers worldwide. 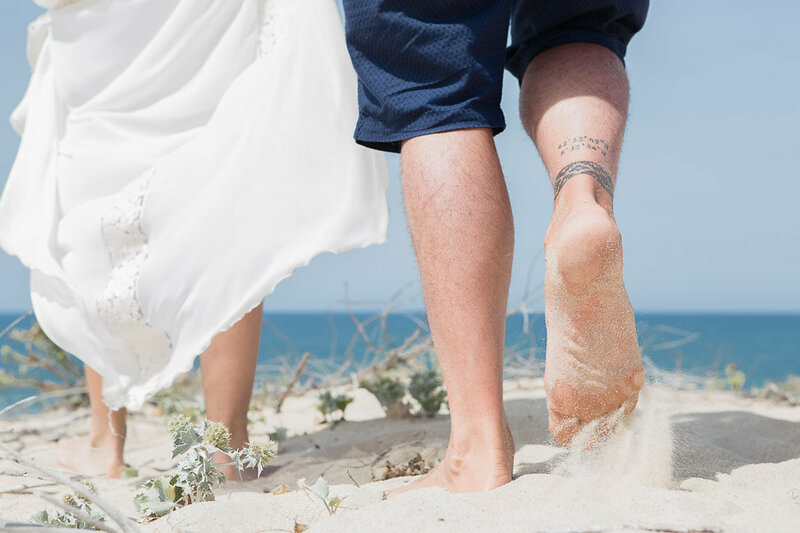 This beautiful couple chose this Magic Dune located at Hossegor Beach. 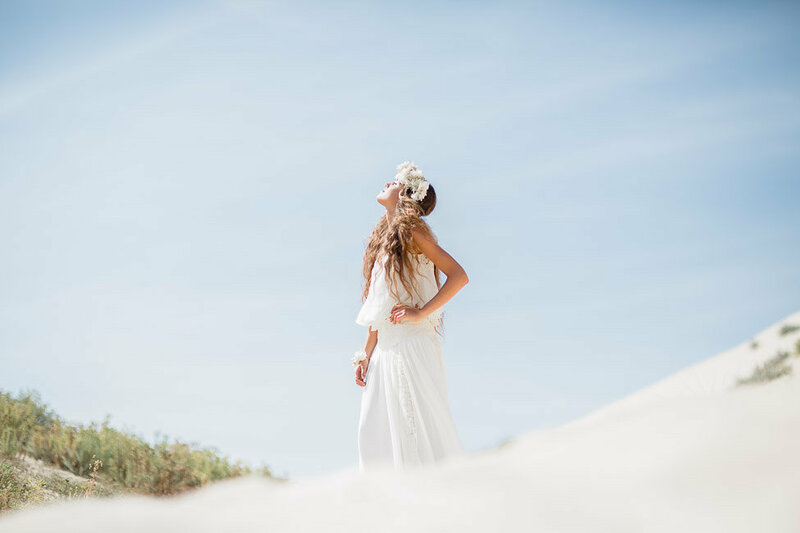 Their wedding was a beautiful ode between the ocean, the sand and the sun. It’s a different way to understand life. 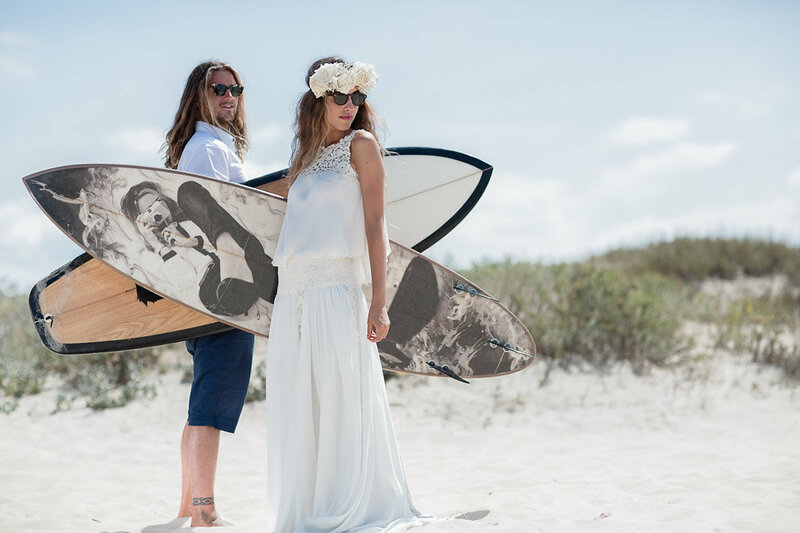 Pure nature, untethered life and two souls celebrating this “love party” under the french sun with their handmade surfboards designed by “The Shaper”, a retired surfer. 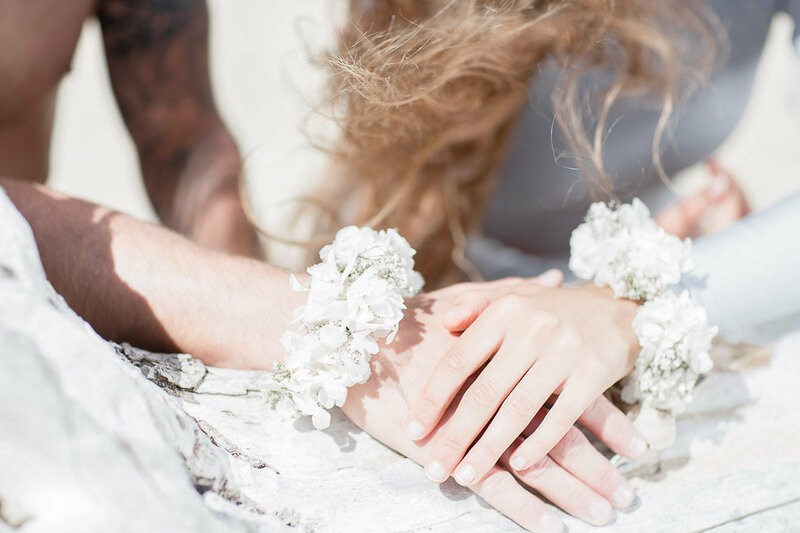 A beautiful paradise where they said YES. 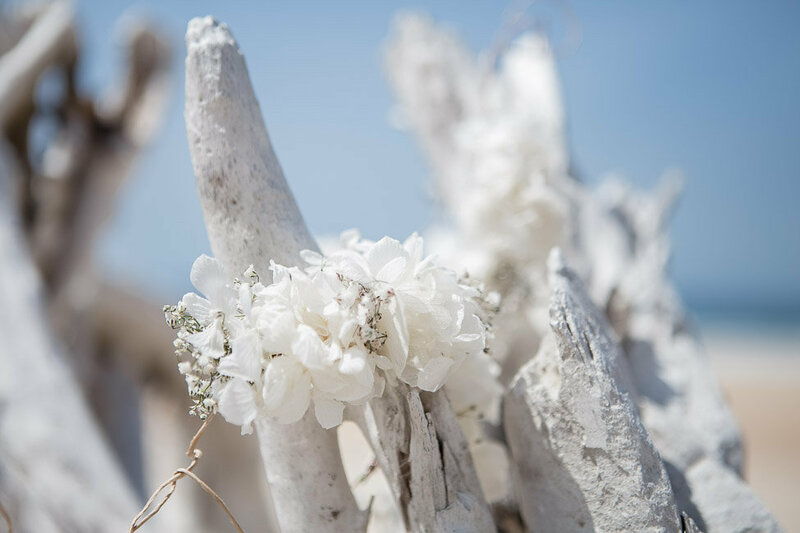 A breathtaking Floral Crown made of freezed-dried flowers (white roses, mini white hydrangeas and baby breath) in addition to their floral corsages used for they vow exchanges and love union and complete the overall look. 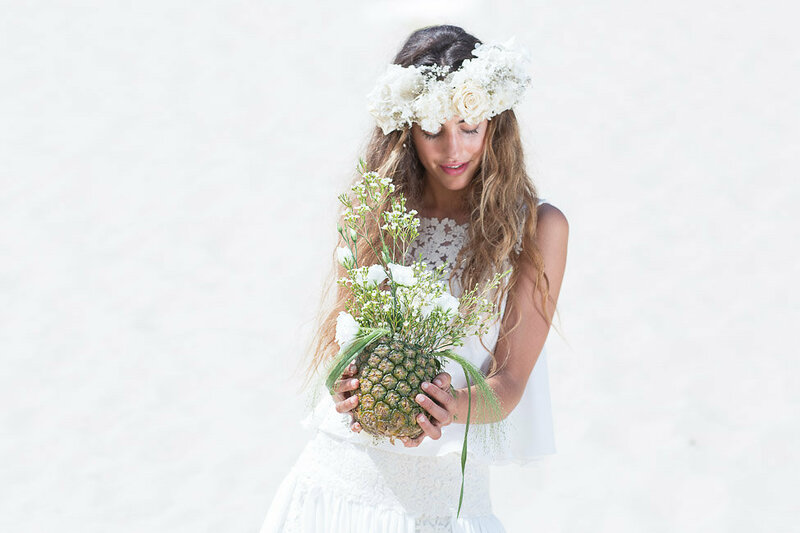 Another creative touch of the day was designing a different bridal bouquet; made with flowers in a pineapple. 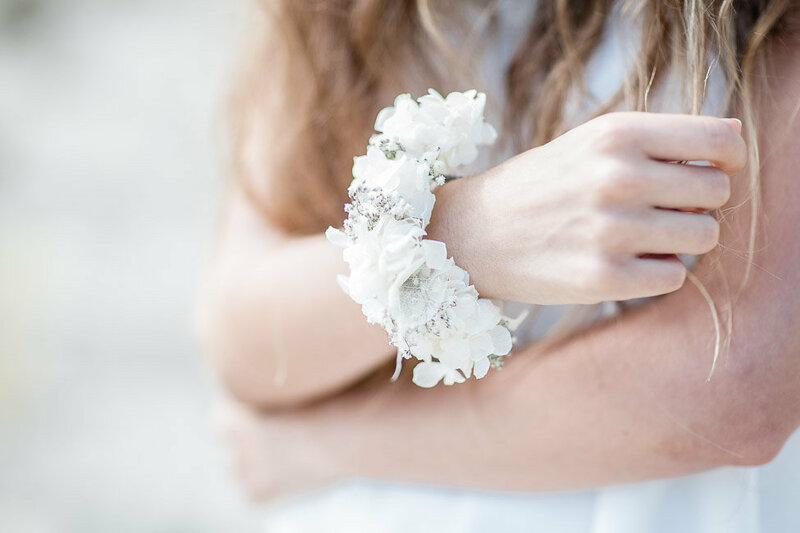 An exclusive design by Floristería Baigorri. 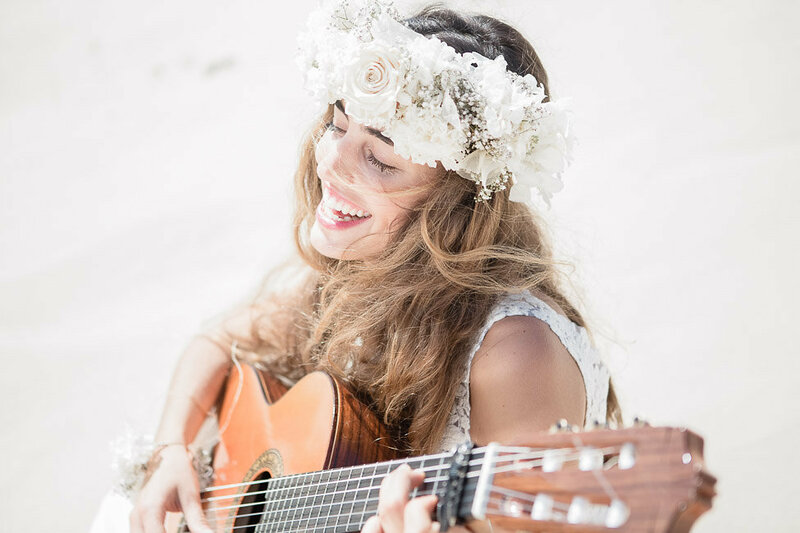 The bride wearing a beautiful Boho Style Bridal Dress designed by Yolanda Torres; one of the Top Bridal Designers in the North of Spain and South of France. 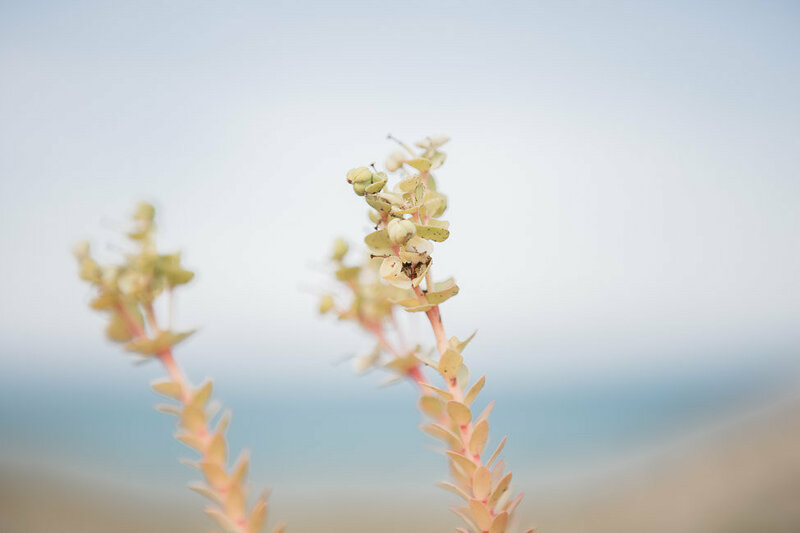 The natural make up made by herself at the beach, using a Dior mascara and Chanel lipstick…it aligned with her own style; natural, crips but beautiful! The groom, was wearing a very original outfit from a unique Concept Boutique called “Milako“, perfect for the occasion. 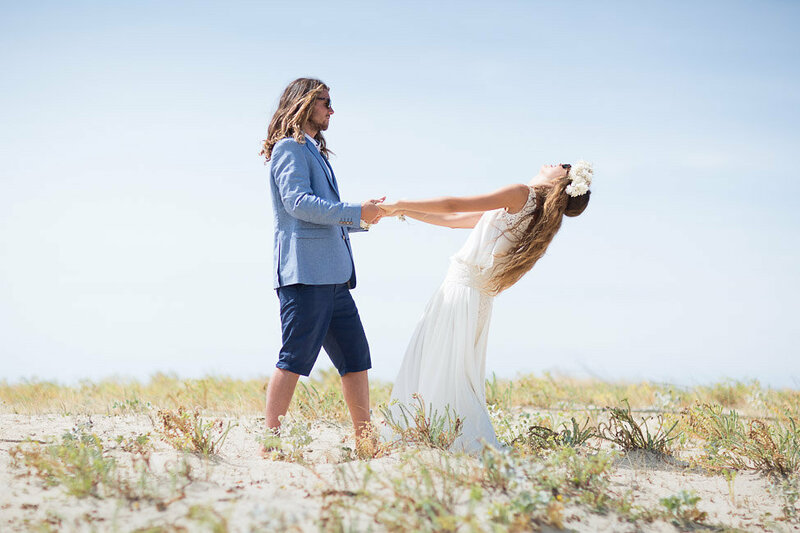 Once the wedding was celebrated, the couple went into the water to consolidate their union wearing two beautiful silver swimsuit pieces from designer Nuria from N Concept for the brand “Kionita” new collection. 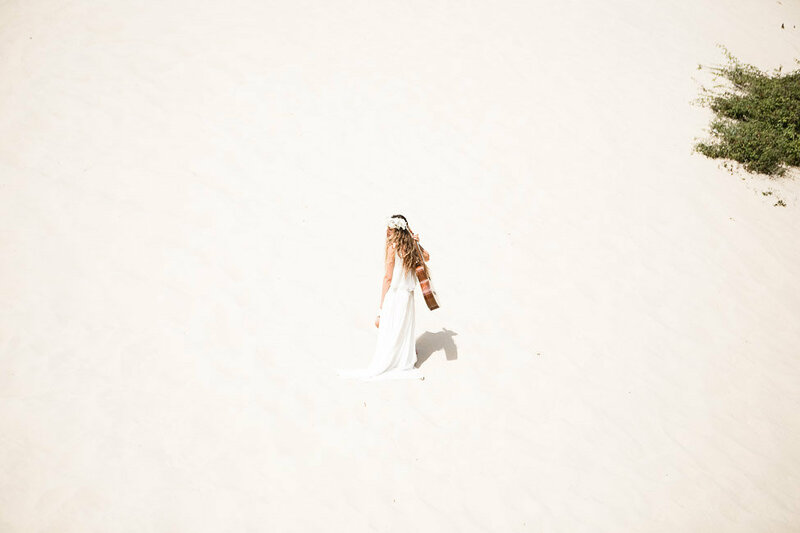 It was a lonnnng way to get to the dune; under the sun, feeling the sand in our toes while carrying the guitar, surfboards, a fantastic range of wetsuits in case it got cold, and all the beautiful decor. 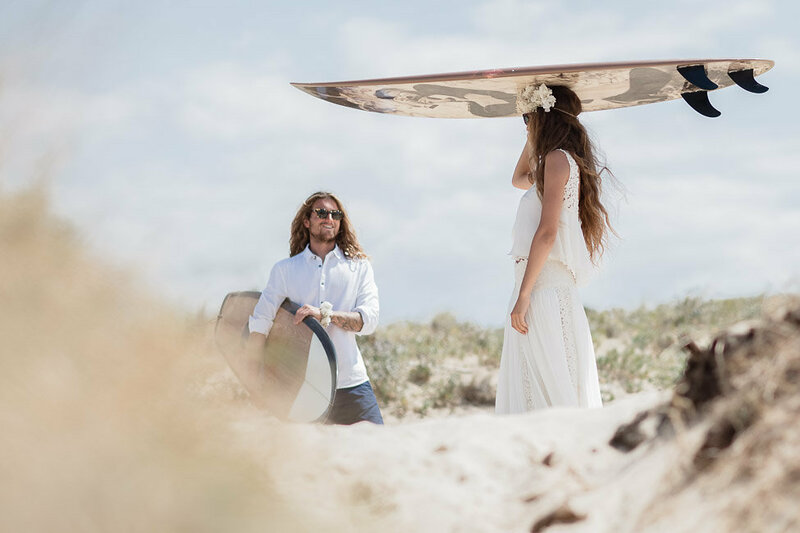 However, Irene & Mikel, are two wonderful souls who had fun along the way to their ceremony spot, making some sweet and romantic gestures, showing their love to the team and feeling happy and excited while carrying those beautiful handmade surf boards and the guitar! 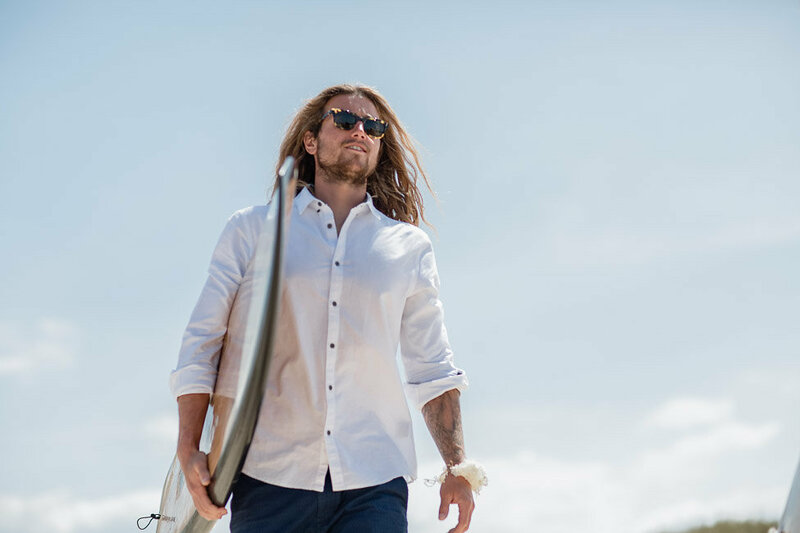 They danced, laughed and share with us some great stories about their surfing days. 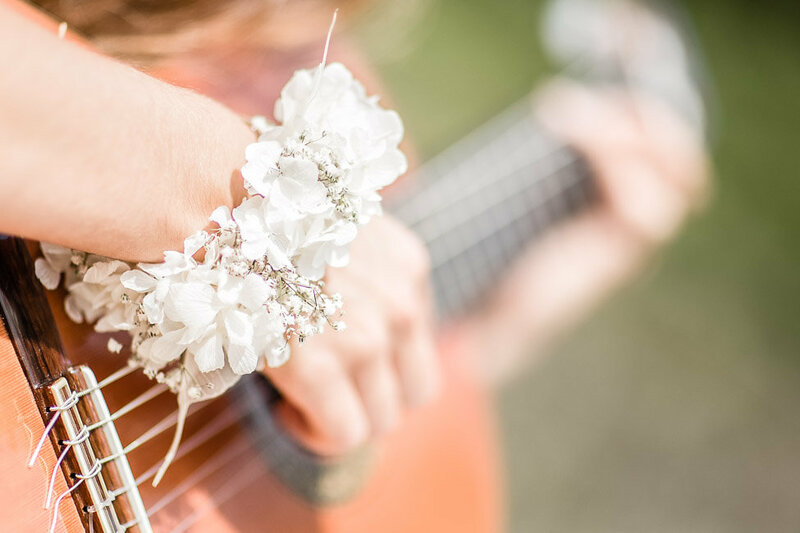 Irene, the bride, while they were resting under the shadow of the umbrella during their intimate reception, decided to impress him, with some surfing songs playing the guitar. The whole team enjoyed this precious moment. 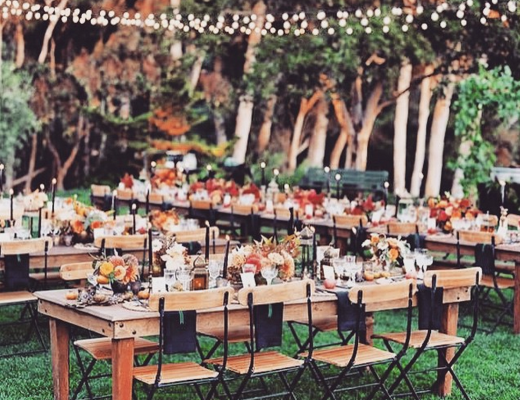 Reina de Bodas was in charge of the beautiful table design based on a surfy-boho style. 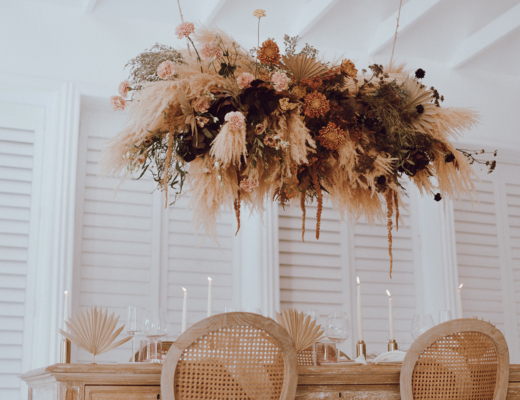 An original wedding table, just for two, with unique decor elements and flowers, ready for their secret celebration in a secret garden close to the beach. A colorful watermelon cut by the team with a lot of detail while listening to “Floating Vibes” by Surfer Blood. 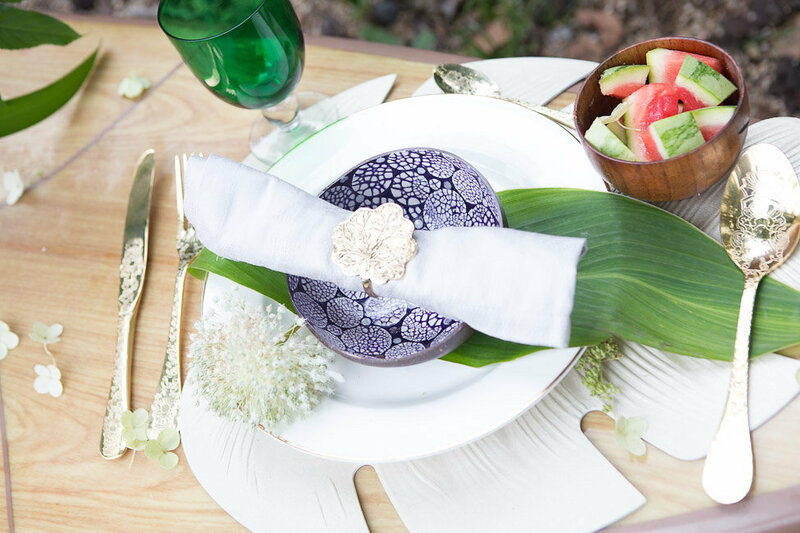 A relaxing and chill afternoon under the sun combined with the unique flatware and tropical-boho touch of the dinnerware, was the perfect match for this intimate wedding. 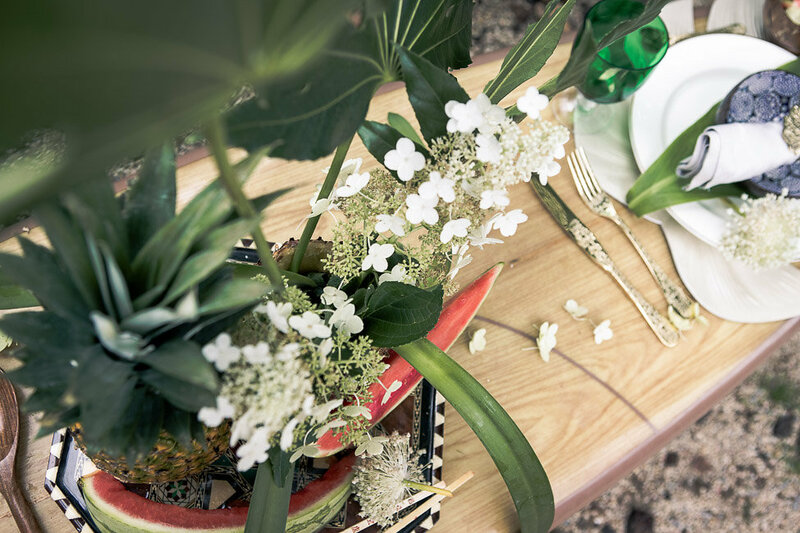 Studio Bastiaan, a Urban Design Studio provided us with the unique wooden furnitures. 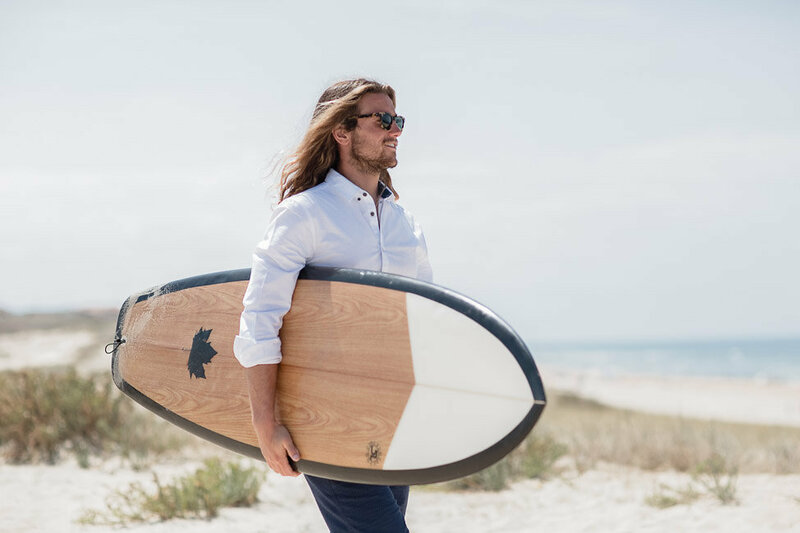 Vasver brought their cool surfboard table to give an original and creative touch together with the umbrella from a store in Ibiza (Parasun). 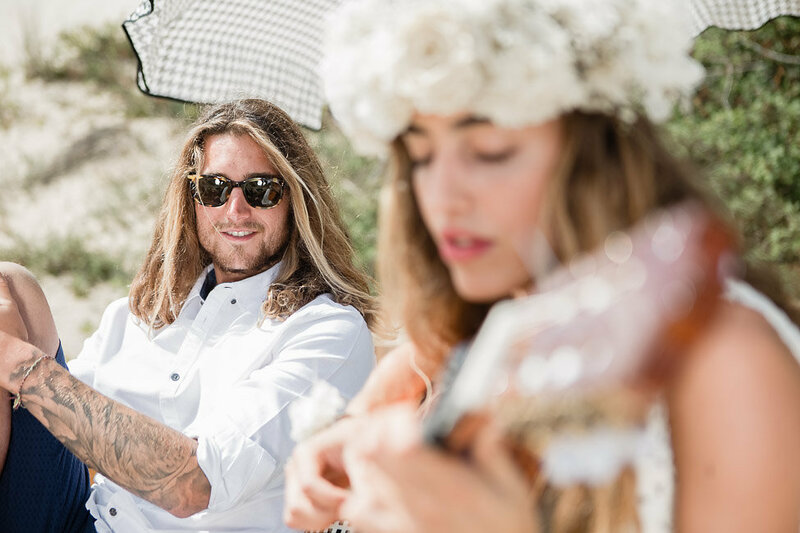 The cool sunglasses from Kabo Company, a local company from the Basque Country gave a cool touch to the couple. 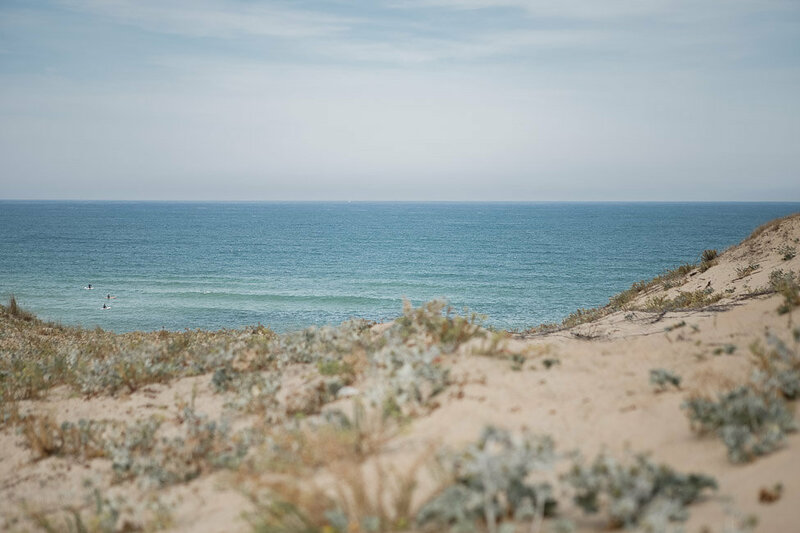 The wonderful and beach cinematography captured during the day by Ruben Crespo & Amaia for Vasver, was the final touch to our day. 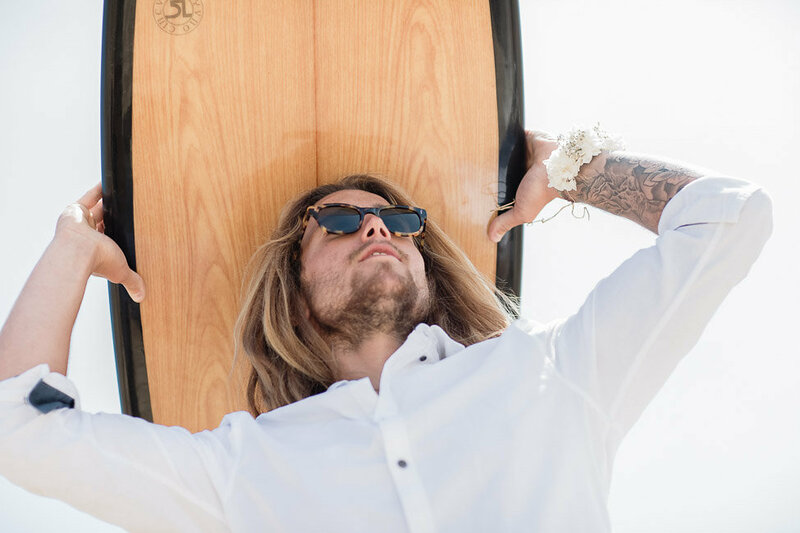 We can only share with you the cool “Shaka Sign” made by every surfer to celebrate this beautiful Boho Surf Wedding as a sign of love and eternal union. 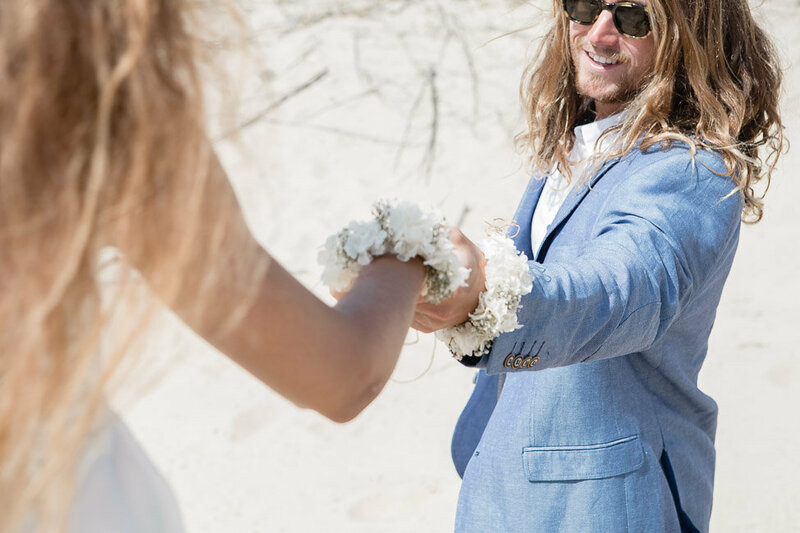 We love this Wedding Inspirational because is all about good vibe and unique style, all blended in a love story that end in the ocean. 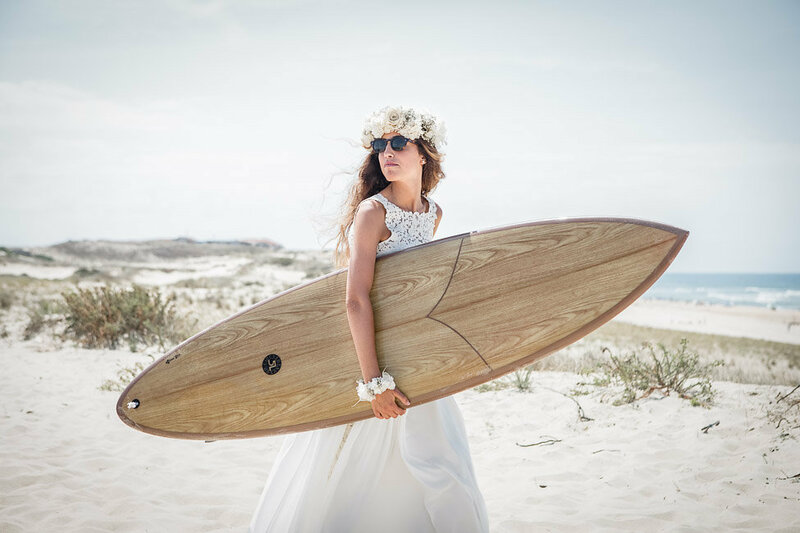 Our advice for those brides who are thinking of celebrating a Boho Surf Wedding is to find the perfect spot in advance. 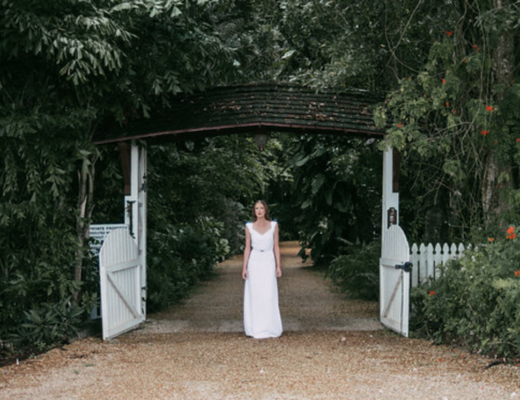 Evaluate the distance, time and difficulty of the way to the ceremony area. 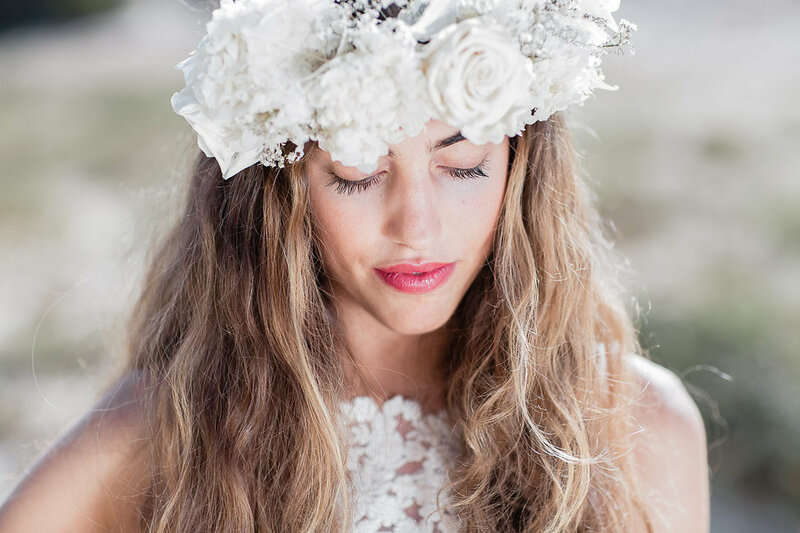 We highly recommend organizing the ceremony during sunrise or sunset, to avoid sun exposure. 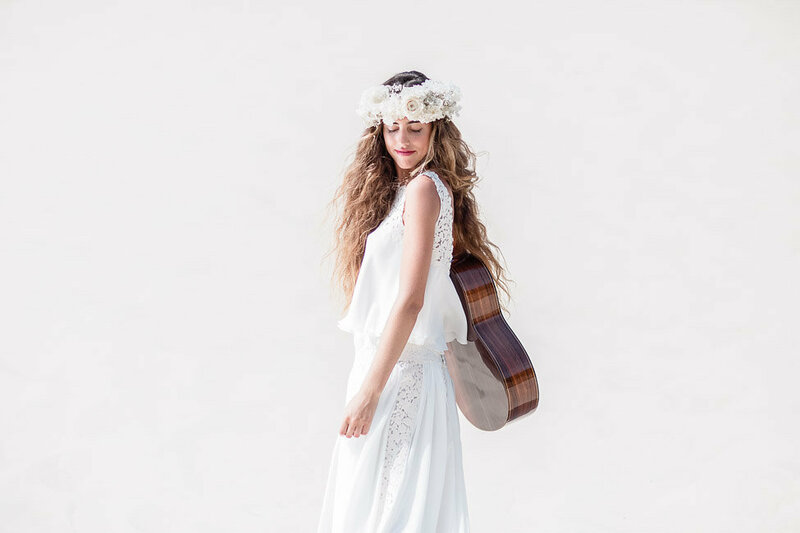 Choose a unique Boho Dress, design everything with a natural touch and make it very intimate. 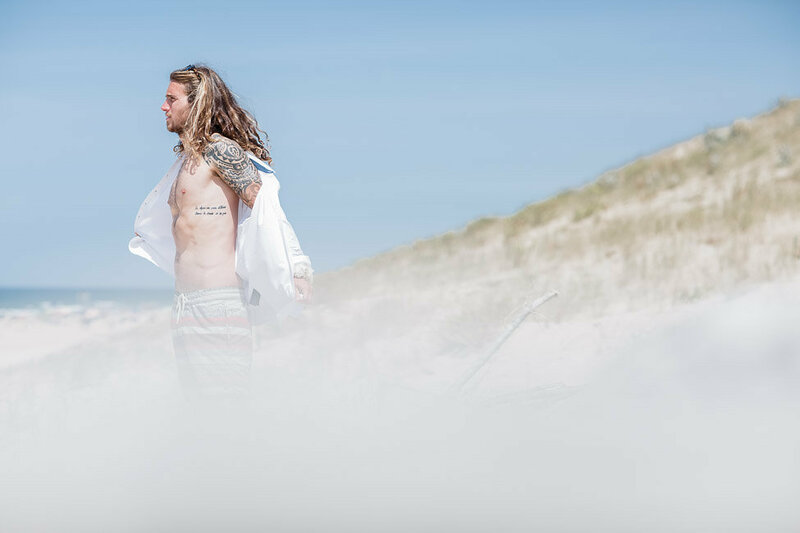 Less is more; the beach is a unique backdrop, and use the ocean as a main protagonist. 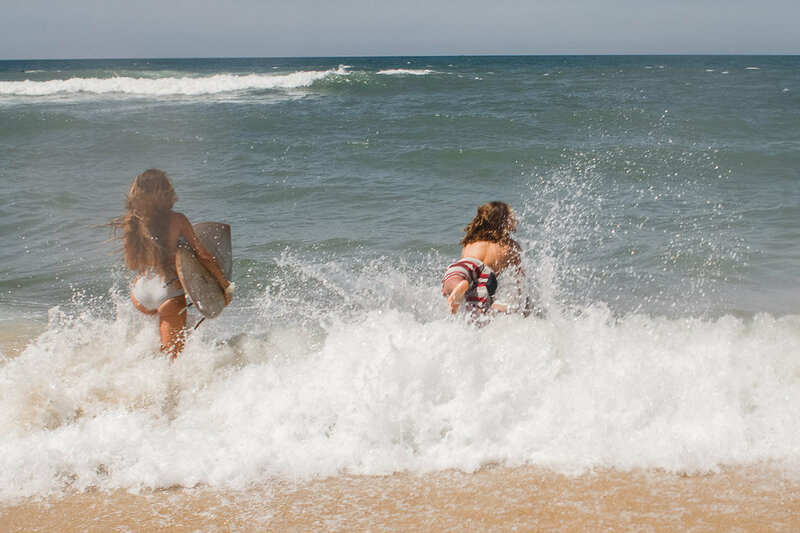 If you are a surfer, we encourage you to consolidate the union while catching some cool waves!